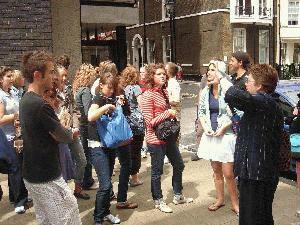 The honors programs at Xavier currently offer study abroad programs in London, Rome, Paris and Greece. The London and Rome programs last five weeks and incorporate two seminars for class credit. Topics of each seminar vary from year to year, and professors are often from a variety of departments such as philosophy, history, and English. The Greece Program is four weeks and is designed to use the country as our classroom. Information about Greece 2020 Summer Study Abroad can be found here. Students take two courses that fulfill core and WCB requirements: one course is taught through Classics (a fine arts, Lit and Moral, or social science); another class is either a 200 or 300 level Theology course, depending on each student's need. The third is ECON 390, which fulfills a variety of requirements and electives for ECON and International Business majors. For more information on ECON 390, contact Dr. Amit Sen (sen@xavier.edu). For more information on the Greece Program in general, contact the director, Dr. Shannon Byrne (byrn@xavier.edu). Financial aid for study abroad programs is available depending on the students' specific needs. For more information on receiving financial aid for a study abroad program, please click here. Interested students should contact Darleen Frickman at 513-745-2009.